With a traditional Bachelor's degree path for new students and a degree completion option for imaging professionals, the Diagnostic Medical Sonography program at NMC can fit your needs. The field of diagnostic medical sonography has rapidly advanced over the years. With new and advanced tools available today, the role of the imaging professional and the needs of the patient have grown dramatically. Nebraska Methodist College has designed a program for the medical imaging professional who wishes to specialize in the care of women. Graduates will be skilled in serving patients with unique psycho/social needs, including coping with fetal loss, breast cancer, infertility, and the complexities of high risk obstetrics. What is women's medical imaging? Degree completion for associate degree graduates -- those who are ARDMS or RT registered and looking to go on for their bachelor degree. No previous coursework required; students can apply directly out of high school. Courses delivered in a hybrid format: on campus and online. Transfer students who are ARDMS registered will receive credit for prior learning based on specific credentials. Opportunity to select additional elective coursework and clinical experiences related to Neonatal Neurosonography, Fetal/Pediatric Echocardiography, Adult Echocardiography and Vascular Technology. Clinical rotations that expose you to diverse populations, facilities and technology. Experienced, certified faculty that integrate real-world experiences into the coursework. A community of people that support you in your quest to be a successful imaging professional. Our program is tailored to the working professional with a framework and course design that provides flexibility to balance professional and personal commitments with your academic goals. 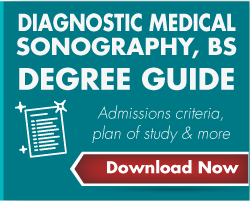 Nebraska Methodist College offers different degree programs in diagnostic medical sonography to fit your current level of education and/or certification. We've illustrated the most common situations below as a guide. For information specific to your situation, please contact one of our admissions coordinators. *For degree completion ONLY: Current ARDMS or RT (US) registration in OB/GYN and Abdomen required.